FORT WORTH, TX and DETROIT, MI--(Marketwire - February 8, 2010) - EVCARCO (OTCBB: EVCA) announced that a formal agreement with Wheego ( www.wheego.net ) has been formalized. The agreement provides EVCARCO with the dealership and certain strategic territory rights to the trendsetting All Electric Vehicle. "The Wheego, based on the Smart and Mini Cooper formula of small, innovative and entry level price point, was developed using the latest technology as well as a strong ergonomic focus," Scott O'Neal, COO of EVCARCO, stated. 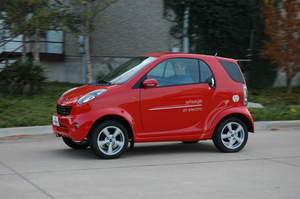 "The Wheego is one of the best examples of a highly versatile and efficient all electric vehicle. It is built to be an electric vehicle so the consumer feels that this car really is a car for the future." The impressive assumed growth in market share of the Wheego reported by the Wheego executives is over 1000% in 2010 with over 3500 units available for the American market. The initial units selling its dealership network have done so at a record rate and projections seem to be in line with Wheego's top management. The model of providing the latest in electric vehicles with a sustainable support network is giving consumers both access to all electric vehicles as well as confidence to purchase the latest in automotive technology. "The business model of EVCARCO has been further supported through agreements such as this partnership with Wheego," stated Dale Long, CEO of EVCARCO. "We are thrilled to be a hub for the American Electric vehicle industry. The Wheego is one of first core products and we feel that with the unmatched price point and overall quality that we can reach high market penetration in a short period of time." The Wheego is based on three governing principles: Zero emission, durability and accessible price point with a CARB certified driving range of 55 miles per charge. The 96 Volt AGM System and 110 or 220 charging capabilities set the bar high. The MSRP of the base model is $21,000 without Federal, State and private sector incentives. Wheego Electric Cars is an innovation-driven and environmentally-conscious manufacturer of Electric Vehicles (EVs). Under the leadership of Mike McQuary, CEO and former MindSpring entrepreneur, Wheego Electric Cars has become a leader in the integration of advanced technology components. Wheego Electric Cars is one of the first EV companies to deliver affordable, fully capable, street legal electric cars for everyday consumer use. For more information about Wheego, visit the company website at wheego.net.